Castro – Que dois-je faire? I’d meant this next post to be a poem; but instead a minor coup. 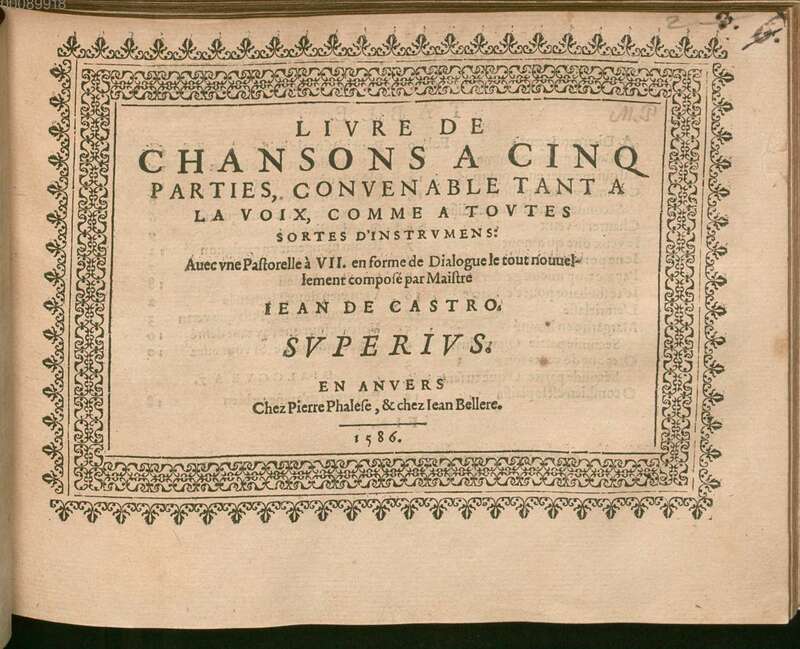 This song by Castro has not generally been recognised as a Ronsard setting – though Jeanice Brooks spotted it in her edition of Castro, it was missed by Thibaut and by the Ricercar online “Catalogue de la chanson de la Renaissance 1480-1600“. As you can see from the link to the blog post above, it is indeed the closing sestet of one of the earlier (and more famous) sonnets. Castro has been better-served by the recording industry than some of his contemporaries, but there is still far too little of his music available. 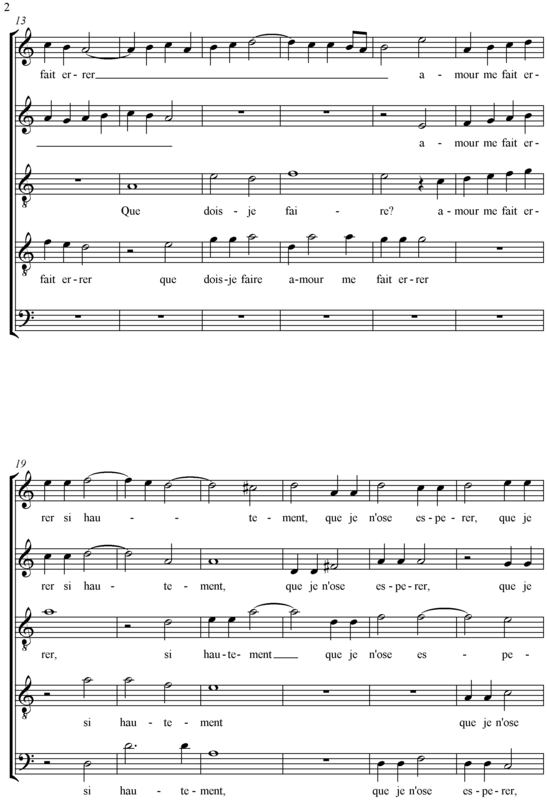 Perhaps because unrecognised as a Ronsard setting, this song has not been recorded yet. Yet this setting is typically excellent. 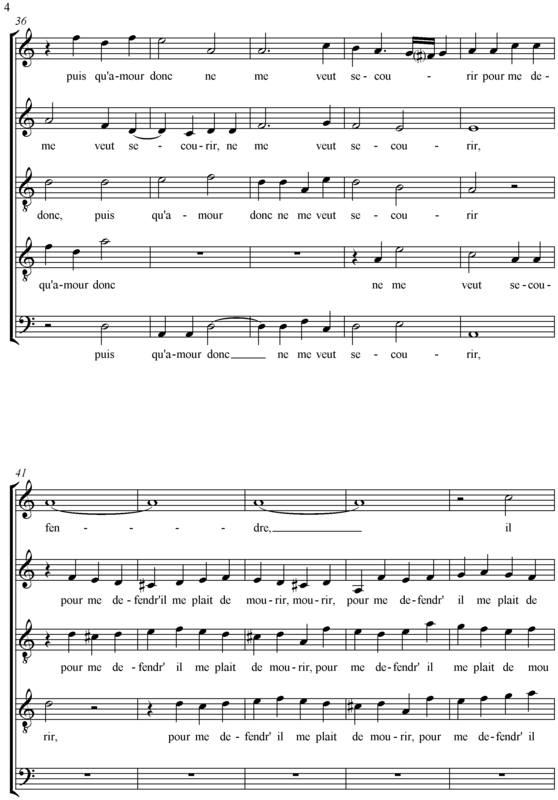 There is a marvellous contrasting section in bars 40ff, where the three middle voices chatter along while the top voice holds long notes; there is a marvellous variety of movement throughout, and the only weak point (if it is one) I can suggest is the way the bassus simply outlines D and A for much of the time. Thanks to the Bavarian State Library for its excellent digital selection, from which I ‘borrowed’ the picture above & which I used to transcribe the song. As we move towards the end of his book, Regnard continues to ring the changes: he writes here in a very fluent imitative style, constantly shifting the number and disposition of voices, to create a piece which sounds delightful throughout, shifting seamlessly from the long notes of ‘grief’ at the beginning to a happier-sounding second half. Typically, Regnard sets only part of Ronsard’s poem, cho0osing the section with the maximum short-range contrast of emotion. Sadly, this is one of those pieces not yet recorded by anyone. 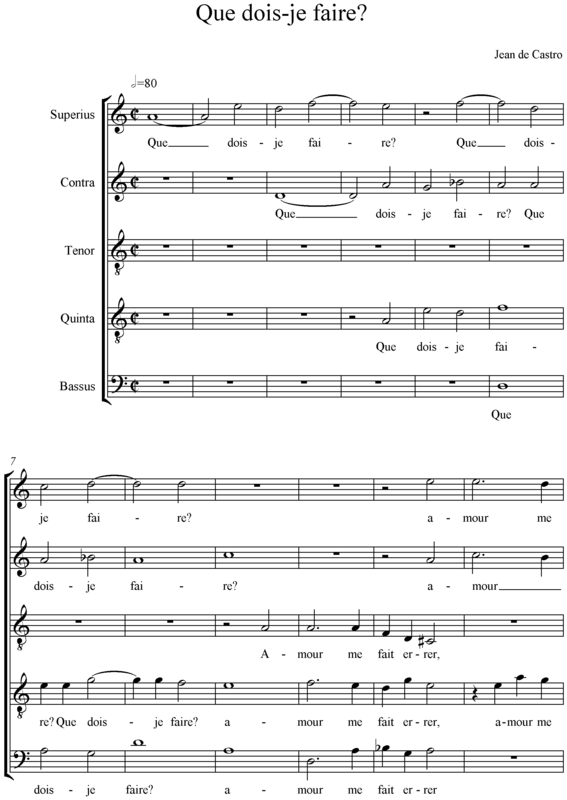 Here Regnard’s 5th voice is an extra tenor, but with a fairly low alto part as well he fluidly switches between a texture which is in effect melody + 4-part harmony, and an ensemble opposing the 2 upper voices and the 3 lower ones. (There are of course other combinations as well.) It’s an attractive piece, whose melodic invention is enhanced by the way the ensemble keeps changing. Once again, the Ensemble Clément Janequin provide the recording. 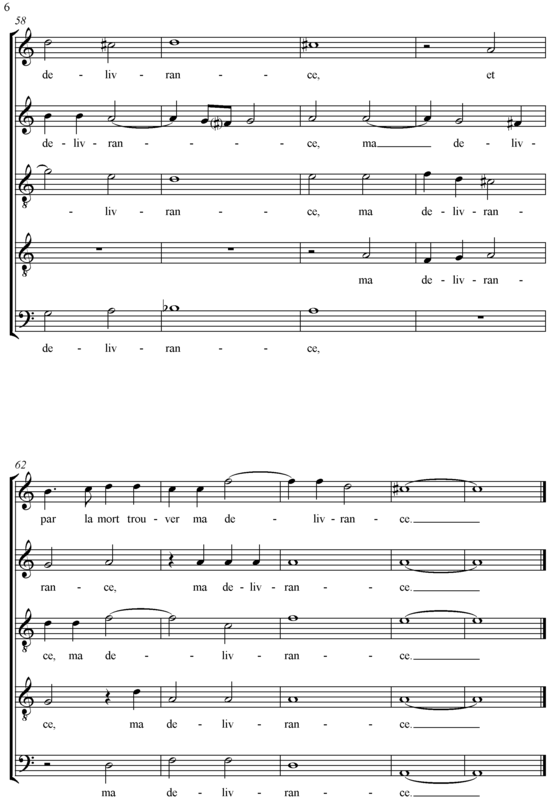 In this case they choose a rather mournful pace & a similalry consistent texture throughout – unofrtunately, as I think they could have made this sound rather better! I’ve provided bars 38-63. Another beautiful, if melancholy, 5-voice setting by Regnard, this time a very extended setting. Yet still it is not a complete sonnet – in fact Regnard has used the middle section of a sonnet, rather oddly setting an odd number, 7 lines, of poetry! 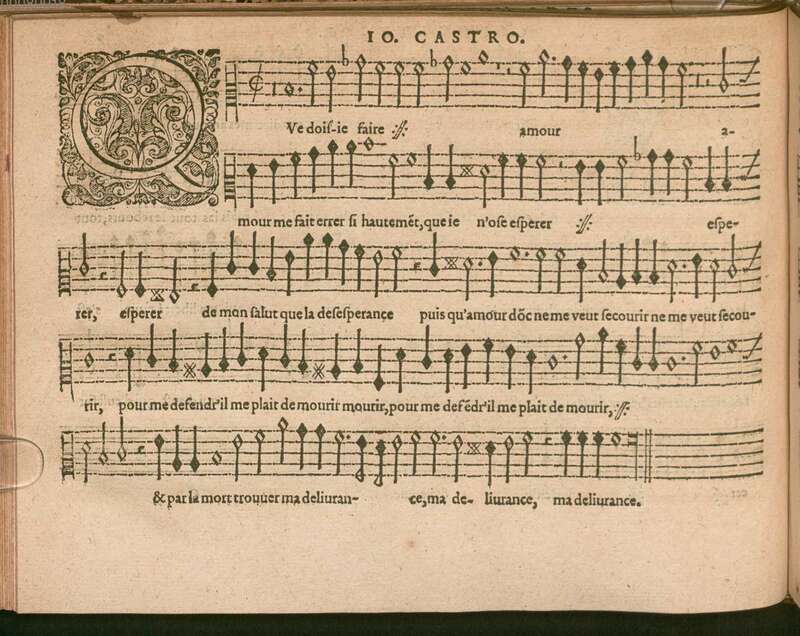 Like so many of these later 16th-century settings, it’s not yet made it onto record! 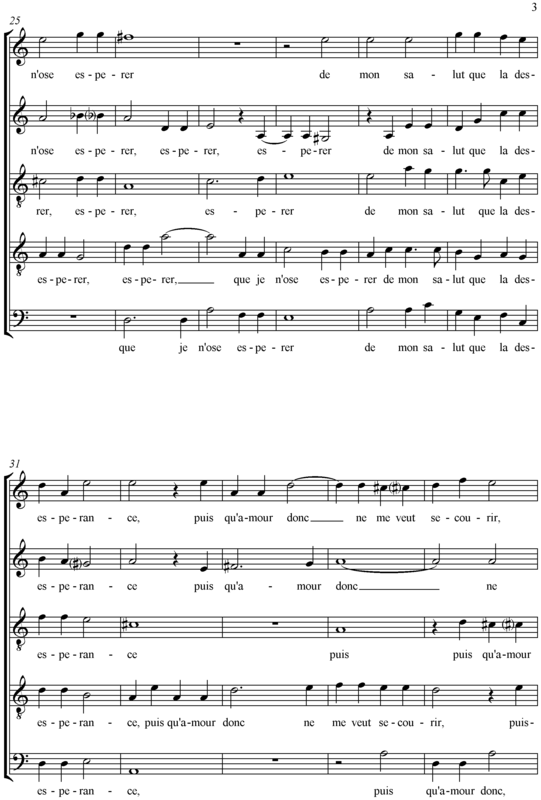 Note also the flexibility in the vocal parts – overlapping, repeating or borrowing phrases, or just going their own way: it’s a very good 5-part structure. Again, in Pevernage’s next song, we’ll see a very different approach as he expands his ambition again. An attractive setting from Regnard: though we ought to have some sympathy for the contra. 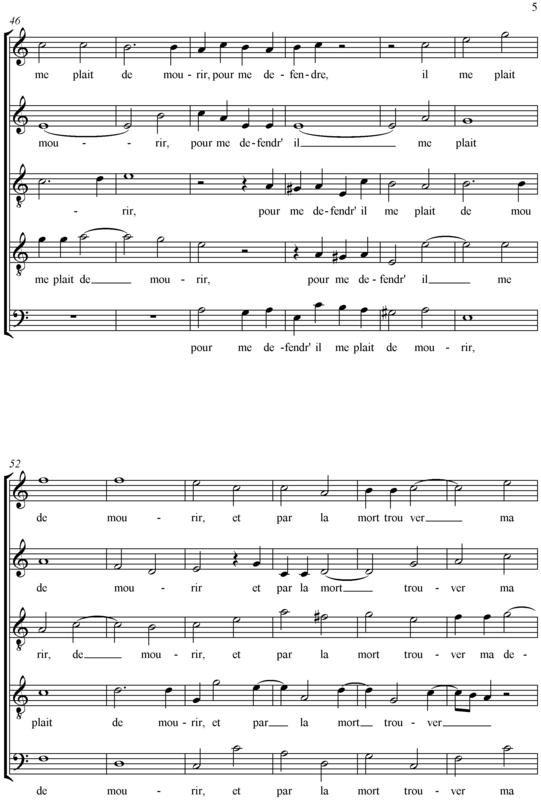 She (or he, in the recording) spends over half the song constrained to a range of a third – most of pages 2-6 – though with a few chromatic notes Regnard does manage to create an interesting part for most of the time! Regnard once again shows his preference for short texts: a 6-line setting this time, though he gives it quite an extended setting.